Artists from around the world and who are above the age of 16 can submit their paintings online for the annual competition conducted by the artist's magazine. If you possess a creativity, which is unique and would like international exposure, Artist's magazine provides the platform for young budding and professional artists from around the world. Send in your entries before May 1st, 2017 and to avail early bird discounts register before April 3rd, 2017. Winners’ names and work will be featured and finalists’ names published in the Jan/Feb 2018 issue. 9 finalists will be showcased in the magazine’s “Competition Spotlight” feature. 12 finalists will be featured as “Artist of the Month” on our website. Award winners’ names and work will be featured in the December 2017 issue. Portrait/Figure- Portrait and figure entries can be individuals or groups, and will be judged on expressiveness and draftsmanship. Still Life/Interior- Entries will be judged on overall design, unique arrangement of subject matter, handling of medium, lighting and mood. Landscape- Any landscape, from city scenes to imaginary horizons, will be judged on the creative use of form, space, lighting and mood. Abstract/Experimental- With unlimited subject matter, entries will be judged on creative use of design, texture, media, lighting or special techniques. Animal/Wildlife- Any animal in any setting is fair game for this category. 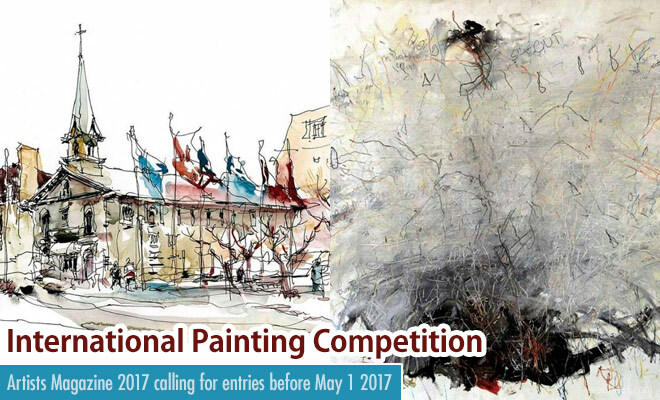 Entries will be judged on the innovative handling of the subject, the expression and rendering.